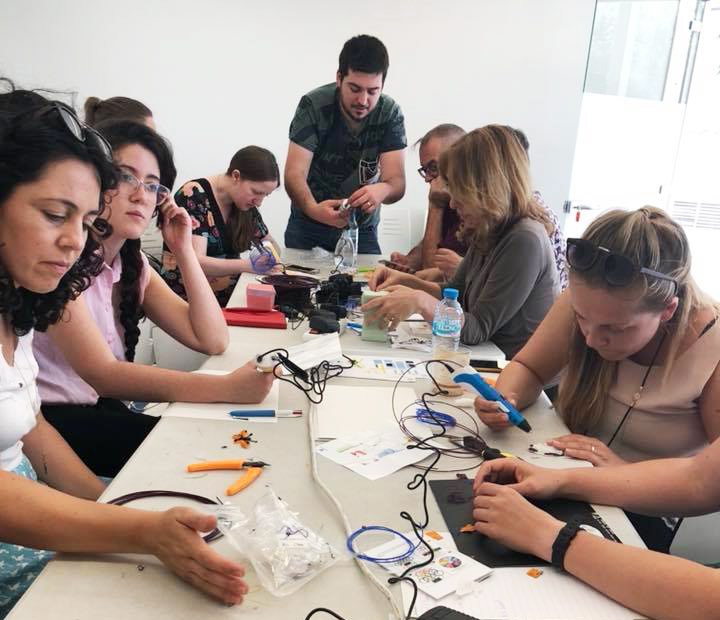 The Creative Makers partners met for a fourth time this June in Vilanova i la Geltrú – a marvellous harbour city near Barcelona – thanks to our hosts Neapolis. The goal of our visit was to exchange and develop ideas about how, why, and what to teach children. Neapolis invited us to experience the workshops they usually organise for children. Based on those, and also on our previous study visits, we discussed how to combine technology and letterpress to reach children. Marc, Neapolis’s resident educator and one of the founders of FunLab, introduced us to robotics. He did it in FunLab’s usual style. The course was entertaining, with a hands-on approach, and focused on experimental learning, programming, and design. As the name itself suggests, FunLab aims to teach electronics in a fun way to people of all ages. Considering how interesting the learning process was, it got us thinking as to why more classes – especially science classes – are not taught. Over the course of the week, we learned how to use a very user-friendly design programme called Tinkercad. Using it, everyone could design their own objects and then print them out using a 3D printer. We had a chance to observe 6-year-olds using this program and we were impressed with the ease with which today’s children absorb modern technologies. Perhaps it really is true that children today learn programming and design programmes as easily as our generation mastered Excel and Word. 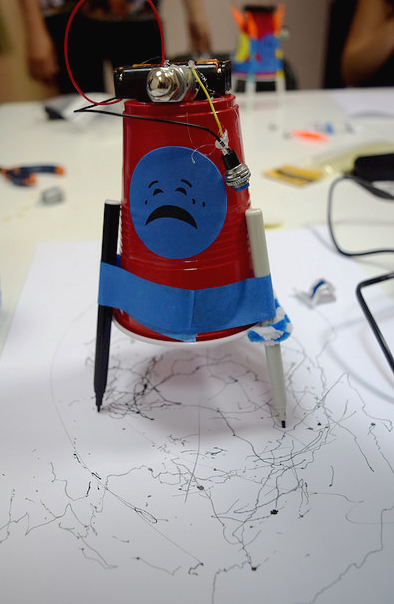 In addition to testing out 3D printers, we also tried to draw with a 3Dpen. While the two principles are very similar, the main difference lies in the fact that one prints with the help of a machine while the other requires the use of your hand. 3Dpen therefore combines innovative technology with an element of craft. 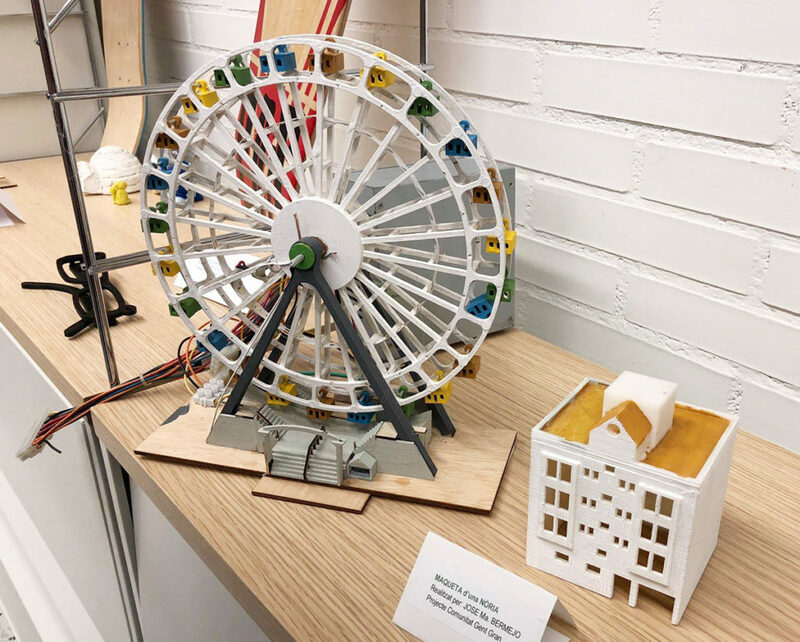 Anyone who can handle a pencil can use this machine to build objects out of plastic– or add additional decoration to any 3D printed object. The most inspiring part of our visit to Barcelona was the Ateneu de les Corts. This organisation is open to all visitors and aims to share its understanding of modern technology and equipment. Instead of working for financial compensation, they faciliate an exchange of services to help local people implement their ideas. There are only a few requirements to participate: each project must be socially useful and solve a recognisable problem. Also, every participant must bring his or her own materials and find a way to compensate the organisation as long as it does not involve money. The Ateneu allows participants to use all their in-house equipment and software programmes and succeeds by bringing together different people who could be useful to each other. Compensation can be made in a variety of different ways such as conducting a workshop for children, giving a lecture to students, or collaborating with someone else on their project. The Ateneu inspired us with the ways it empowers the local community. Everyone learns about new technologies by using them. The project participants find new ways to express themselves and turn their ideas into reality. The rather unusual rule about providing compensation shows theparticipants that they have something to offer to both the organisation and to others, which genereates pride and increases one’s self-worth. While such a system for organising work may sound very unconventional in today’s world, it works – at least in this specific context and with some governmental support. The projects created by children were possibly the most impressive. The Ateneu has been able to help children think critically, come up with solutions to everyday problems, and then put them into practice. Another institution successfully empowering local children is the CosmoCaixa Museum. It hosts a Tinkering Space: an area where one can unleash one’s inner inventor and go hands-on in order to design, make, and modify one’s own creations – and even the very space itself! It is a perfect place for inventors, creators, and dreamers – or for anyone else who has ever wanted to make something with their own hands. 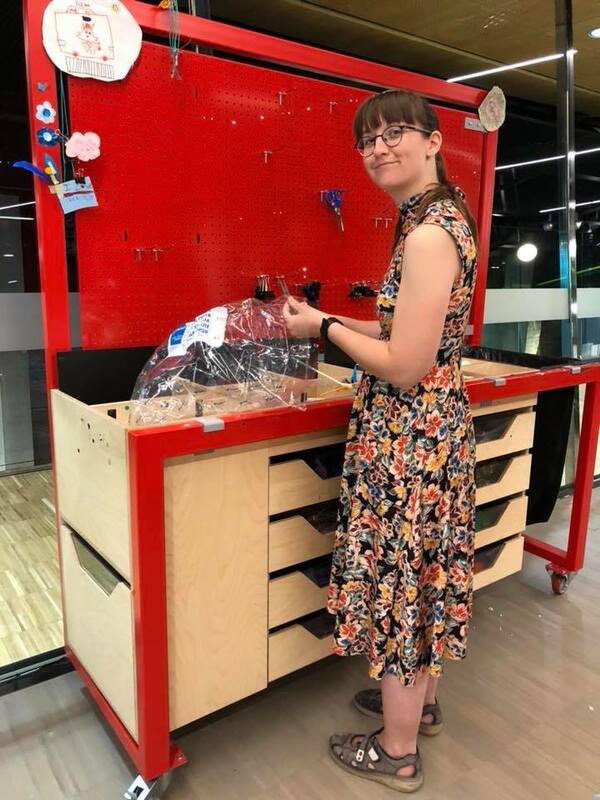 The Tinkering Space consists of five areas: a stopmotion area, where children can create their own animations; an air flow area, where they can invent objects that fly; a light and shadows area; a robotics area; and a motorized area. The idea behind the Tinkering Space is to trust children’s creativity. They are given freedom to experiment, solve problems, think, and discover new things in a safe environment. We flew back home to Tallinn full of inspiration and ideas how to build up our own creative space for children and facilitate their learning process in its premises. In the meanwhile, visit some of Estonia’s very own wonderful places for children – the Energy Discovery Centre in Tallinn, the Science Centre AHHAA in Tartu or the Seaplane Harbour Museum in Tallinn!